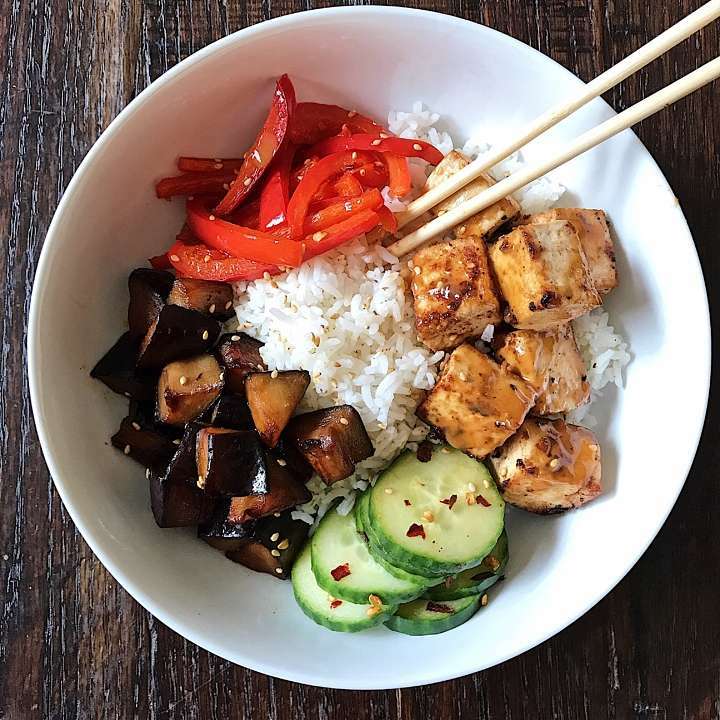 Stir-fried sesame eggplant & peppers, roasted almond butter tofu and spicy Quick Pickled Asian Cucumbers over rice. The key is finding some good marinades and sauces. These bowls and the yummy sauces are adapted from The Minimalist Baker. The tofu marinade is sesame oil, almond butter, gluten-free tamari, lime juice, maple syrup and a few squirts of sriracha. The veggies are stir-fried in a similar sauce, minus the almond butter. I also added “pickled” cucumbers recipe adapted from Bon Appetit some tangy flavor contrast. So flavorful – a little savory, a little sweet, a little tangy– & so cozy! As you know if you’ve been following me a while, the rest of my family isn’t a huge fan of peanut sauces of any kind so this recipe is great because the sauce is on the side. And they ate chicken instead of tofu. Savory, with a little sweet and a little tangy, these simple bowls are packed with flavor! Tofu bowl recipe adapted from The Minimalist Baker. Quick Pickled Asian Cucumbers adapted from Bon Appetit. In a small bowl or liquid measuring cup whisk together all sauce ingredients until well combined and smooth. Taste and adjust seasonings as needed, adding more tamari for saltiness, lime juice for acidity, Sriracha for heat, or maple syrup for sweetness. Set aside. In a large skillet, over medium high heat, add 1-2 tbsp oil and heat until shimmering but not burning, add eggplant. Saute for 1-2 minutes. Drizzle with 1 tbsp tamari, 1 tbsp maple syrup and sesame seeds (optional) and sauté, stirring frequently an additional 2-3 minutes or until browned on all sides. Set aside. In the same pan, add 1 tbsp oil, and when hot, add peppers, Drizzle with 1 tbsp tamari, 1 tbsp maple syrup and sesame seeds (optional) and sauté, stirring frequently for 2-3 minutes or until crisp-tender. Cook longer for softer peppers. Set aside. Place Rice in a bowl, along with eggplant, peppers, tofu and cucumbers. Top tofu with additional almond butter sauce. Sprinkle veggies with sesame seeds for garnish if desired..
You always come up with the most creative combos – thanks for the inspiration! I can’t wait to try!! !